Dry and floral on the palate, a chilled glass of sparkling Montenisa Brut NV Franciacorta complemented by dainty canapés: foie gras, smoked salmon and oyster Rockefeller set the recent Antinori wine dinner at Nero Vivo off to an jovial start. Held in the cheery haven of Italian cuisine where chef Michele Cuozzo holds fort, the event saw passionate Italian food and wine enthusiasts sharing an evening of convivial laughter and light-hearted banter with Vice President of Antinori Wine Albiera Antinori. Before dinner started, Albiera touched on the rich history behind the Antinori family which has been involved in the production of wine for over six centuries since 1385. Now into its 26th generation, the firm remains a family-run entity headed by Marquis Piero Antinori with the support of his three daughters: Albiera, Allegra, and Alessia. The evening's pace acquired a startlingly refreshing note thanks to the crisp, citrusy white Castello della Sala Cervaro della Sala 2010. A blend of 90% Chardonnay and 10% Grechetto harvested from 15-20 year old vineyards, the elegant white bedazzled us with its straw gold tinged with greenish hue, faint floral-flinty bouquet and long, structured finish. Its persistent toasty and mineral notes were perfect counterpoints to the supple, matured richness of the roasted provolone cheese with cinnamon scented, red wine poached pears. Tubular shaped pasta – a typical Neapolitan special – brimming with an indulgent amount of gooey, cheesy stuffing complemented by delicate pieces of bamboo lobster in fresh tomato sauce achieved sublime gustatory heights with Marchese Antinori Chianti Classico Riserva 2010. This Badia a Passignano Riserva is produced exclusively from the finest Sangiovese grapes of the property by the same name in the Chianti Classico area of Tuscany. Seductively voluptuous on the palate, the ruby red wine enthralled us with its ripe berry-cherry nuances and velvety liquorice spiciness. Artfully blending Cabernet Sauvignon, Merlot, Cabernet Franc and PetitVerdot, the lush, dark red Guado al Tasso 2008 flaunted jammy plum and black currant notes mingled with coffee, toasty oak and spice overtones. Its soft, elegant tannins sustained a smooth, lingering finish that held its own against the deep-seated flavours of the roasted duck breast with asparagus, fig jam and balsamic vinegar sauce. Finger-licking great lamb chops with potatoes and mixed salad complemented Guado al Tasso 2004, an excellent tipple that boasted 50% Cabernet Sauvignon, 40% Merlot and 10% Syrah. Scored 92/100 by Wine Spectator, the ruby red wine with its complex fruity-toasty nuances of coffee and dark chocolate, balanced, soft tannins and lingering finish bore testament to the wine's strong regional character. For the night's finale, we made short work of the luscious cake with almond paste and chocolate served with vanilla ice cream that went superbly with the golden yellow Castello delle Sala Muffato della Sala 2007, a well-balanced wine with intense floral and honeyed aroma and taste, underscored by fresh, almost citrusy notes. 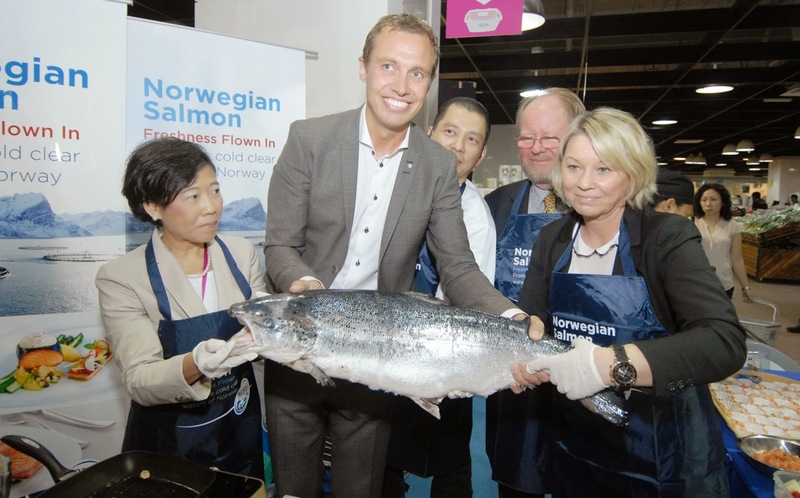 Norwegian salmon - one of Norway’s best known international exports - has such wide appeal in the Malaysian food scene that the volume of Norwegian salmon exported to Malaysia reached 1,900 tonnes last year. 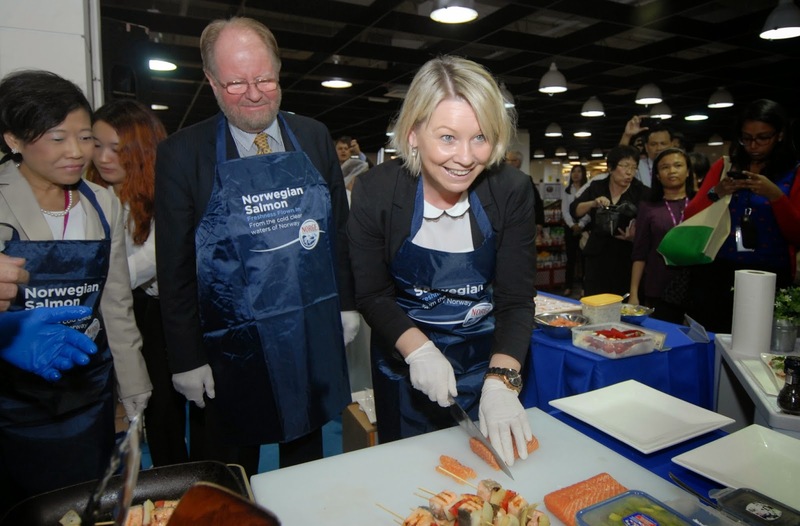 Such flavourful figures have prompted Monica Maeland, Norway’s Minister of Trade and Industry to visit Kuala Lumpur recently; to familiarise herself with the marketing of Norwegian salmon and support the marketing activity conducted by the Norwegian Seafood Council in Malaysia. 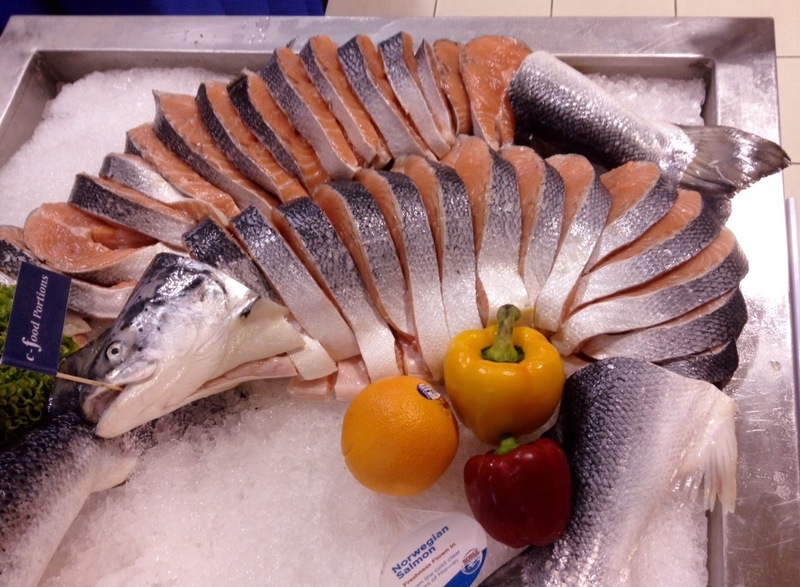 A hefty 9kg Norwegian salmon had the 'starring role' at the AEON Bandar Utama supermarket on that momentous day; placed on a bed of shaved ice barely 48 hours after its swift passage by air to Malaysia from Norway’s cold, clear waters. 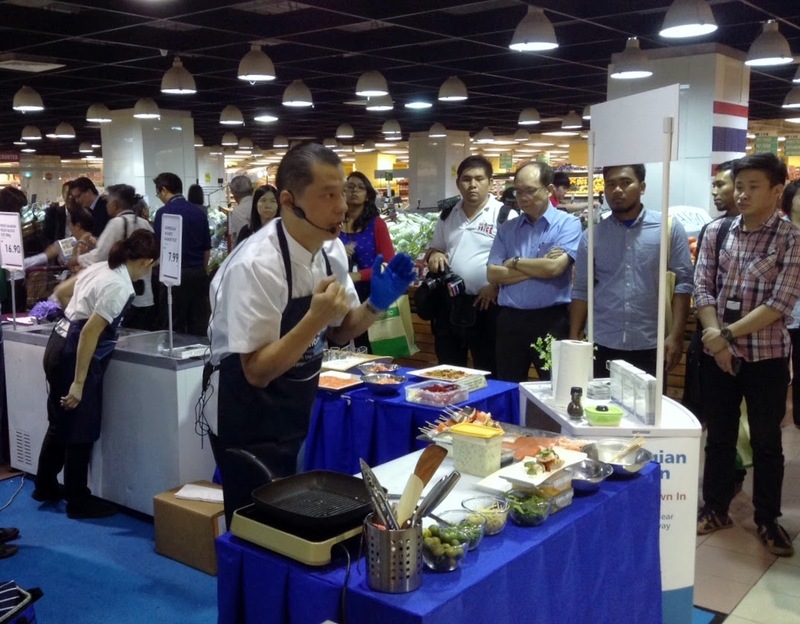 Adding more chutzpah to the ministerial visit was chef Jimmy Chok from Singapore who caught the imagination of local media members and AEON shoppers with his inventive salmon recipes that combined Asian flavours with European cooking techniques. Rich in nutrients and a vital part of a balanced diet, Norwegian salmon is a good source of protein, vitamins D, A and B12, iodine, antioxidants and vital marine omega-3 fatty acids. With approximately 15-25% protein per 100 g of edible flesh, the fish contains lots of essential amino acids. 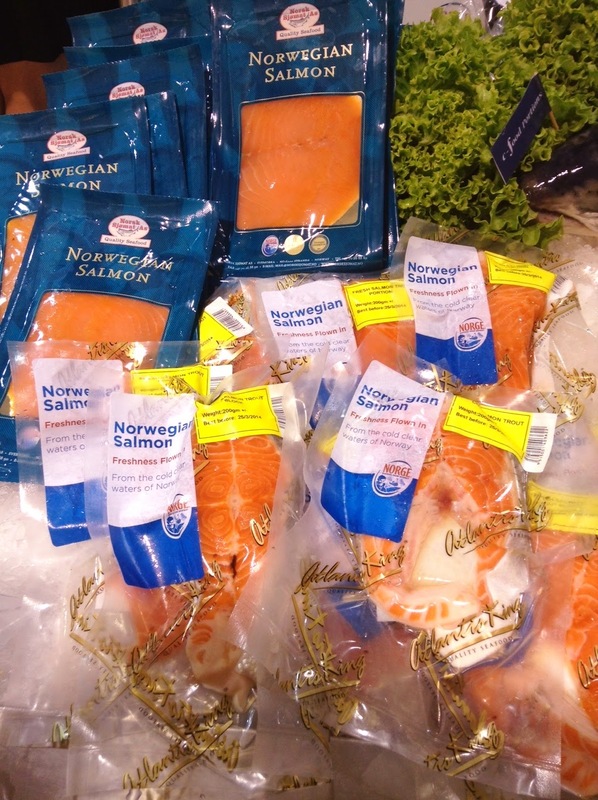 Organised by the Norwegian Seafood Council and Innovation Norway, with the support of AEON CO. (M) BHD, the fresh Norwegian salmon is supplied by Euro-Atlantic Sdn Bhd, a leading importer and distributor of marine produce, specialty fruits and vegetables based in Kuala Lumpur. Below are the two simple yet superbly delicious salmon recipes by Chef Jimmy Chok for you to try at home. 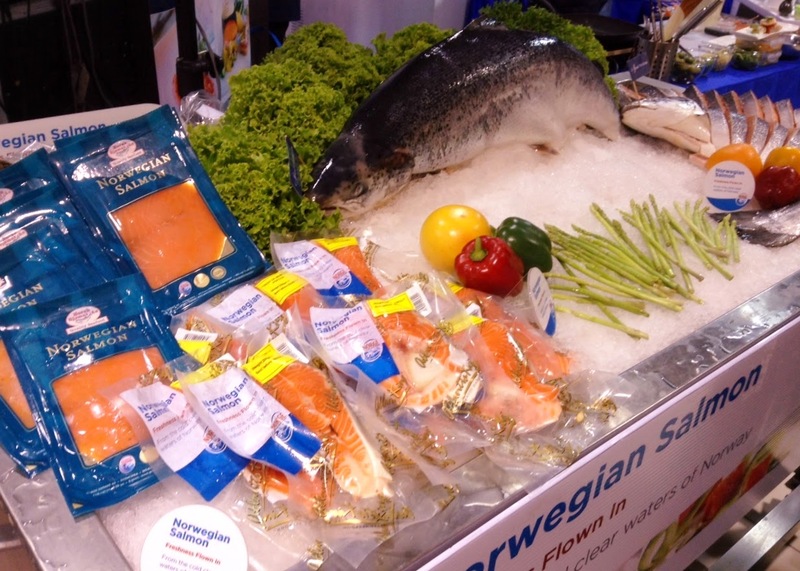 You can also visit www.salmonfromnorway.com for more recipes and information from the Norwegian Seafood Council. 1. Soak 6 satay sticks in water for 10 min. Marinate the fish with cumin and season with salt. 2. Skewer each stick with 3 cubes of salmon, alternating each piece with bell pepper and red onion. 3. Heat up the grill and cook over medium heat for about 3 min on each side. 4. Mix the yoghurt with coriander and lime juice. Adjust seasoning to taste. 5. Serve the salmon kebab with the coriander yoghurt. 1. Slice salmon loin into sashimi-style thickness. 2. Arrange salmon slices onto a plate. 3. Top with ginger julienne, chilli and coriander leaves. 4. Drizzle soya sauce and sesame oil all over the fish slices. 5. Served chill as appetiser. Squeeze calamansi juice on fish slices prior to serving. Note: This dish can also be served alongside porridge, steamed rice or plain fried noodles.